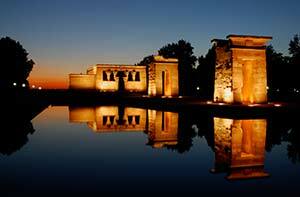 ABOVE: Visits are free at the Templo de Debod in Madrid. Tip 6: Be selective in your sightseeing. Madrid's tourist office has English-language themed walking tours from its office on the Plaza Mayor, with prices of only a few euros. "Ask around at the local tourist office in what ever city you are in. For example, a few months ago we visited Nimes and just happened to go and visit the amphitheatre. They had something on that day (a Saturday) and we, as did everyone else got in free." Finally, just walking around can be the cheapest and most satisfying travel experience--especially in cities like Paris, Rome, Venice, or Stockholm that have beautiful scenery or monuments at every turn. Top photo copyright © Matthew Taylor.